Branching Together opens tonight at Gallery 51 in North Adams! Branching Together unites the work of Helen Hiebert, Sun Young Kang and Michelle Wilson, three artists who work with paper. Each artist is on a journey, a path, a way that branches together and outwards to others. Trees with their branches and roots, reach out to life and death, and invite the viewer to walk the path, the way between. They each engage the viewer, ultimately asking what are the paths that we walk, as child, mother, and citizen? Handmade paper, made from the earth, serves as the primary medium linking these works. But each artist transforms this everyday material into an artwork that invites the viewer to see their reflection and find moments of connection in their own life. 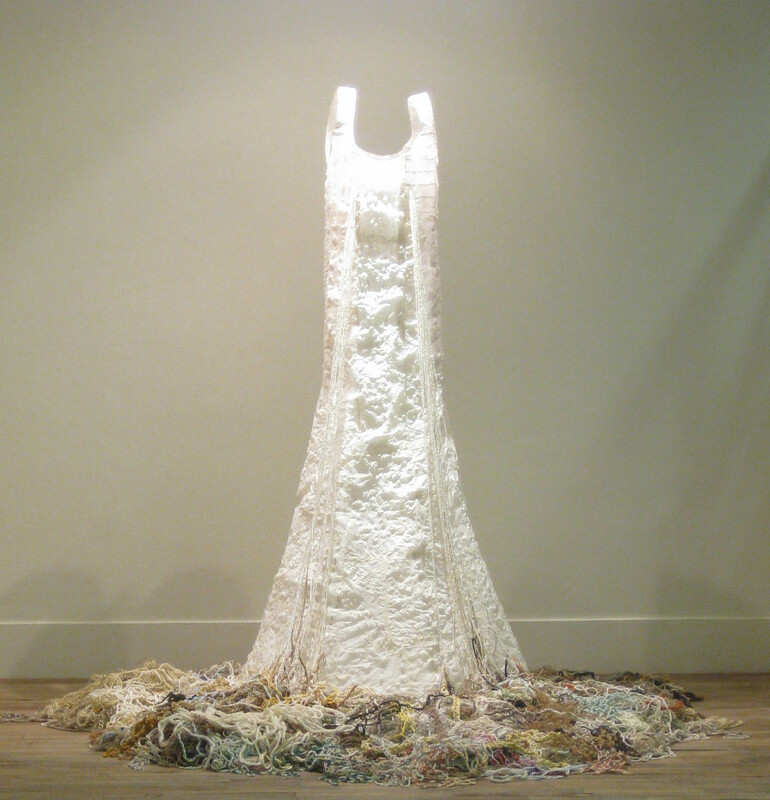 The centerpiece of the exhibit, Mother Tree, is a visual and emotional journey made tactile with natural fibers and was conceived by Helen Hiebert and serves as a symbol of the vulnerability, strength, and sense of community she feels as a mother. Like Mother Tree, To Find the One Way, by Sun Young Kang, also begins with a personal experience, her response to the death of her father, and the inseparability of life and death that connects us all to our ancestors and our children. She too, explores these lifelines that connect us all to our past, as well as our future. 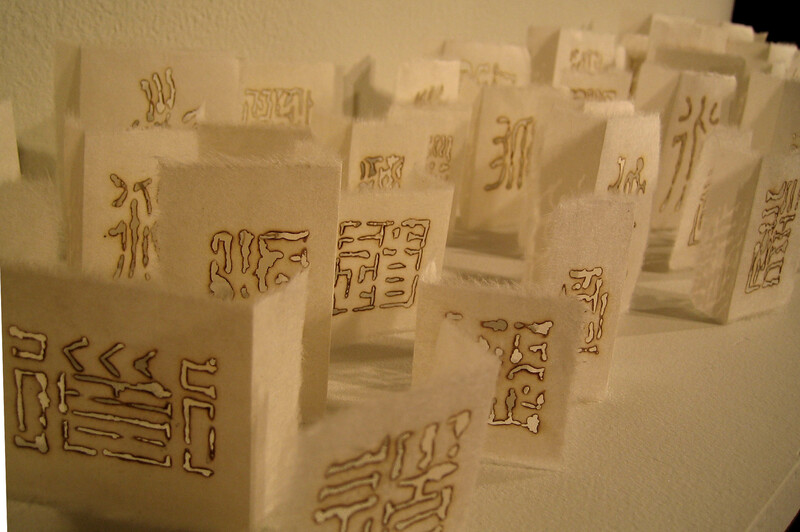 To Find the One Way is inspired by the Buddhist idea of the number 108 and the renderings of the character (Tao), which has various meanings, including “path” or “way.” Kang extends the play with the number 108 by extending it to 1080 pieces of paper, all marked with the (Tao) character. Kang used burning incense to make the negative space on each page, creating absence, which represents death or loss. When lit, the absence creates a shadow. This shadow has triple significance; it draws attention to the negative space, and the absence the space suggests, and it calls to mind memories of the one who is absent. Every character of emptiness on the paper creates 1080 different ways or paths. Each of the paths connects absence and presence, the past and the now, the loss and the memories, and death and life, lifelines of dualities between which we all journey. 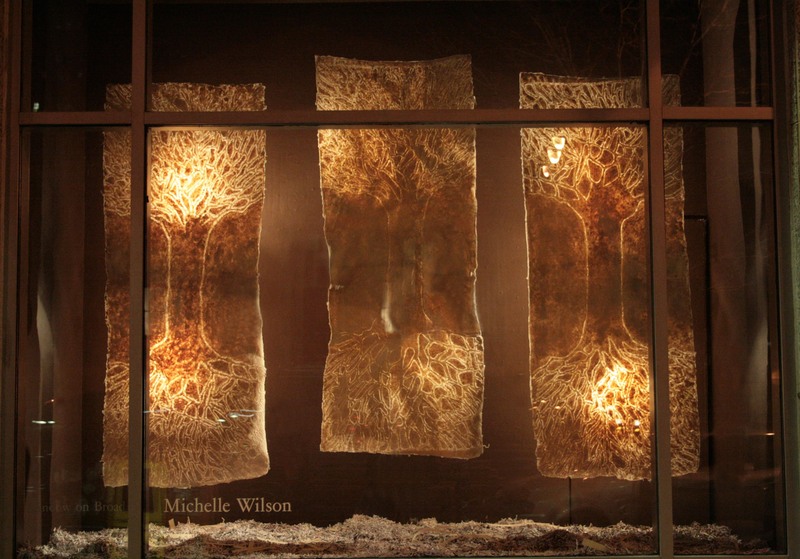 Michelle Wilson, also uses absence in The Ghost Trees. Wilson aims to find the intersections in one’s lifeline where thought takes action, where one decides along the way to make a stand. In her case, the stand represents her love of nature, and the ecological links that paper inherently represents. Through the use of watermarks, this installation creates a “haunting” in the paper itself, evoking the immense deforestation that occurs every year to keep up with the demand for paper. The lines, paths and ways created by fiber, paper and shadow that each of these artists create branch together as they journey from birth, through life and into death. Where are the places inside of each of us that mother, that mourn, that take a stand? How do they branch together in you? How do they branch together in me? How do they branch toward each other, bringing us together as we journey in this great community of earth? I ask you this as the curator, to think about this as you experience this exhibit, what is your path? How is it part of this greater communal journey of birth, life and death? Be sure to join me on March 22nd for a crochet/knit night at Gallery 51. Come crochet/knit a root for Mother Tree.